A brand new, free theater event is coming to Lawndale this summer. On Sunday, August 5 at 4p.m., Chicago Shakespeare in the Parks will present ‘The Taming of the Shrew’ at Douglas Park, 1401 S. Sacramento Avenue. For the first time in the history of Chicago, Chicago Shakespeare Theater (CST), Chicago Park District, and The Boeing Company partner to launch Chicago Shakespeare in the Parks, providing a live, free for all, professional theater performance in neighborhood parks across Chicago. Beginning July 29 and continuing through August 19, Chicagoans of all ages will enjoy a free performance of ‘The Taming of the Shrew’ through each of the Park District regions. In addition to Douglas Park, other Central Region parks include: Dvorak Park, Garfield Park Conservatory, Austin Town Hall, Humboldt Park, and Gateway Park at Navy Pier. South Region parks to be visited include: South Shore Cultural Center, Ridge Park, and Tuley Park. North Region parks include: Frank J. Wilson Park and Welles Park. 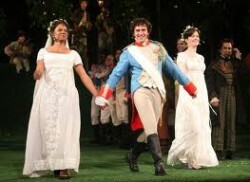 A complete parks schedule can be found at www.chicagoshakes.com/parks.